Keeping a horse isn’t a cheap hobby, but we do it because they bring immense love and enjoyment to our lives. When you tally up how much you actually spend on a month to month basis, it can be a scary figure to look at. If you don’t already know the figure and you do decide to work it out, make sure you’re sat down. With hay, bedding, feed, insurance, shoes, vets and so on, the costs soon add up. So where can you save money, while still maintaining full care and comfort for your horse, and enjoyment from a personal perspective? You can save 70% on your horse bedding, by using a Mayo Mattress. Less bedding… are you mad!? You may begin to wonder how on earth it is possible to use less horse bedding. How can you use less bedding and keep your horse warm and comfortable? Here at Mayo Horse Comfort, the Mayo Mattress is not just a floor covering, ultimately, it is a bed. A supremely comfortable, premium, soft, durable, hygienic bed. Bedding usually plays one of two roles, to provide comfort for the animal, and also to soak up any moisture. With a Mayo Mattress bedding is only needed to absorb the moisture, which means less bedding is required. The Mayo Mattress is supremely comfortable and keeps the horse warm. How much could I save using Mayo? 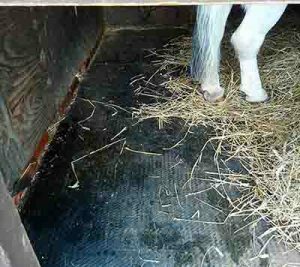 The amount of bedding used differs from horse to horse depending on how much mess they make. We’ve put together an example of the savings that could be be using an average from horse to horse. We haven’t used the minimal nor have we been extravagant; we’ve simply tried to estimate the middle ground. This is to show the savings that could be made using a Mayo Mattress. These different loose bedding costings are representative of values found online in March 2018: Equinola Straw Horse Bedding, 19.25kg – £7.36, New Flake Woodshavings, 20kg – £7.20, Verdo Equine Pellets, 15kg – £5.52. The above may be less than you currently spend on bedding and so the savings would be even greater. This is a conservative figure; you could be saving a huge 70% on your loose bedding costs. Although the Mayo Horse Comfort range may appear costlier at the time of fitting, in the long run it will save you money. This isn’t just on bedding, but also on the product itself lasting much longer than other alternatives. Mayo Mattresses have a minimum of 10-years guarantee and we have mattresses that have been in place for almost 30 years. How many times would rubber or EVA composites have needed to be changed in that period? For a standard stable opting for the Mayo Horse Comfort Mattress at 44mm, you would have paid this off within the year. The Mayo Horse Comfort range will pay for itself overtime while providing the very best comfort for your horse. Finally, it will earn you money in the savings made on bedding overtime, which cuts down one expense on your darling horse. Take a look at the full Mayo Horse Comfort range or contact us with any enquiries.